The Works for Hire Agreement is used when hiring a contractor to create materials you require complete ownership of. Use this agreement to ensure there is no question of the ownership details of materials created by a contractor. If you do not spell out ownership details in your contractor agreements you might not acquire actual copyright ownership of the materials as you would if an employee had created the works. Used when a more clear definition of the copyright arrangement between two parties engaging in work needs to be made. The agreement favors the company and allows the contractor to quitclaim all rights to any works paid for, or incorporated into the company's projects and materials. Special attention is paid to the definition and exclusion of a contractor's "Moral Rights" to any works and the ability to direct their approval and usage. This Works for Hire Agreement is included in editable Word format that can be customized in Word or by using the included Wizard software. 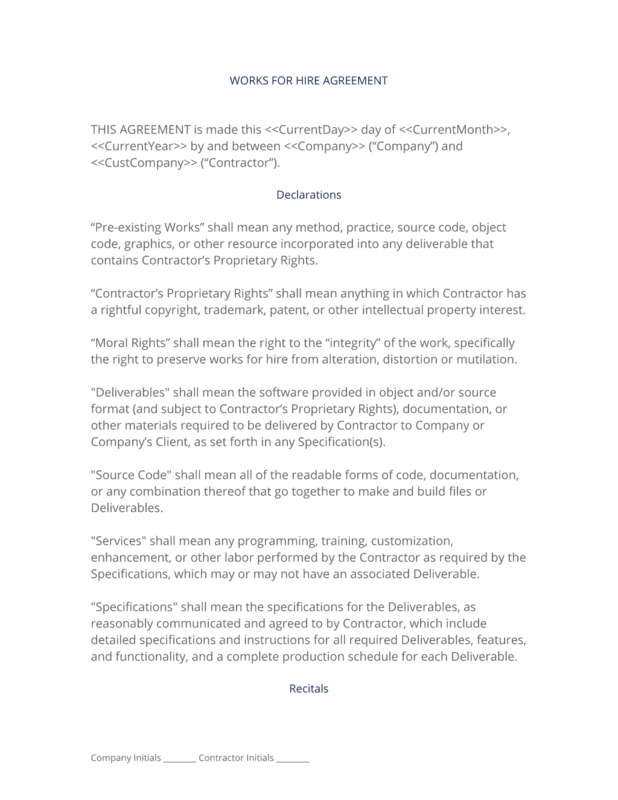 THIS AGREEMENT is made this Current Day day of Current Month, Current Year by and between Company Name ("Company") and Company Name ("Contractor"). "Pre-existing Works" shall mean any method, practice, source code, object code, graphics, or other resource incorporated into any deliverable that contains Contractor's Proprietary Rights. "Contractor's Proprietary Rights" shall mean anything in which Contractor has a rightful copyright, trademark, patent, or other intellectual property interest. "Moral Rights" shall mean the right to the "integrity" of the work, specifically the right to preserve works for hire from alteration, distortion or mutilation. "Deliverables" shall mean the software provided in object and/or source format (and subject to Contractor's Proprietary Rights), documentation, or other materials required to be delivered by Contractor to Company or Company's Client, as set forth in any Specification(s). "Source Code" shall mean all of the readable forms of code, documentation, or any combination thereof that go together to make and build files or Deliverables. "Services" shall mean any programming, training, customization, enhancement, or other labor performed by the Contractor as required by the Specifications, which may or may not have an associated Deliverable. "Specifications" shall mean the specifications for the Deliverables, as reasonably communicated and agreed to by Contractor, which include detailed specifications and instructions for all required Deliverables, features, and functionality, and a complete production schedule for each Deliverable. Contractor has experience and expertise in the development and formation of original written works ("Materials" or "Project"). Company desires to have Contractor develop Materials for Company. Contractor desires to develop Company's Materials on the terms and conditions set forth in Exhibit B attached hereto (the "Specifications"). The term of the agreement shall be for Years years from the date signed. Contractor agrees to the documentation and development of the Materials according to the compensation terms listed on Exhibit A attached hereto. All work performed by Contractor shall be considered "Works for Hire" and Contractor shall be compensated to grant all rights, including "Moral Rights" to the Materials to Company. Contractor agrees to develop the Project pursuant to the Specifications set forth in Exhibit B. Contractor will use reasonable diligence in the development of the Materials and endeavor to deliver to Company all operational Materials and files no later than Delivery Date. Company acknowledges, however, that this delivery deadline and the other payment milestones listed in Exhibit B are estimates, and are not required delivery dates unless otherwise noted in the Specifications. Deliverables defined as "Critical Deliverables" shall be outlined in Exhibit B and shall contain the delivery date and the terms of delivery of the Critical Deliverable. Contractor shall deliver, at all times, any and all material required to complete the Project. Company shall retain all ownership, title, and interest in all Materials, including all Moral Rights delivered under this Agreement. All subject matter created as part of the Materials shall be considered works made for hire and Company shall own all copyrights. To the extent that any rights in the Materials vest initially with Contractor for any reason, Contractor hereby irrevocably assigns and quitclaims any such rights to Company. Contractor acknowledges that the materials contributed and work performed are being commissioned for Insert Project or Materials Name and shall be used in connection with brief usage description. All work performed and/or contributed by Contractor shall be considered "Works for Hire" as defined by the copyright laws of the United States of America. Company shall be the exclusive owner of such works and retain all rights and title in and to the results and proceeds of the Contractor's work, regardless of its level of completion or whether the work is used in part or as a whole. Contractor shall not have any Moral Rights to the Materials or Pre-existing Works incorporated into the Materials or Project or any right to direct or approve their usage in part or in whole. Contractor hereby grants to Company a non-exclusive, royalty-free, nontransferable, worldwide right and license to use, reproduce, modify, and distribute any Pre-existing Works incorporated into the Materials in connection with Company's use of the Materials. Rights and license shall include, but is not limited to, rights to modify any Pre-existing Works to adapt or incorporate the Pre-existing Works into the Materials and to modify the Pre-existing Works to correct errors, add features or functionality to the Materials, and to make the Materials compatible with other hardware or software. By entering into this Agreement, Contractor certifies that Contractor does not and will not violate, conflict with, or result in a material default under any other contract, agreement, indenture, decree, judgment, undertaking, conveyance, lien, or encumbrance to which Contractor or any of Contractor's affiliates is a party or by which Contractor or any of Contractor's property is or may become subject or bound. Contractor will not grant any rights under any future agreement, and will not permit or suffer any lien, obligation, or encumbrances that will conflict with the full enjoyment by Company of Company's rights under this Agreement. Contractor has all required ownership rights and license to grant Company all necessary rights with respect to the Materials, free and clear of any and all agreements, liens, and interests of any person or party, including, without limitation, Contractor's employees, contractors, agents, artists, or any such employees, contractors, agents, and artists who have provided, are providing, or will provide services with respect to the development of the Materials. Nothing contained in the Materials or required as any part or operation of the Materials, or required to deliver the Materials under this Agreement does or will infringe upon or violate any intellectual property rights of any third party. Further, nothing contained within the Materials or any part or operation of the Materials will cause the use, reproduction, resale, or transfer of the rights to the Materials to infringe upon the intellectual property rights of any third party. Contractor has the right to assign and transfer rights to such Pre-existing Works and third-party materials as specified in this Agreement. Unless otherwise agreed to by Company, Project files shall not require any additional software, third-party resources, "plug-ins" or other technologies not listed in the Specifications. Any additional software required to run the deliverables shall be construed as non-conformance to the Specifications. Contractor and Company acknowledge that at some time during the Term of this Agreement, either Contractor or Company may propose enhancements to the Project that fall outside of the scope of the Specifications. Upon such proposal, Contractor shall confer in good faith with Company concerning the feasibility of developing such enhancements and the time frame for developing, testing, and incorporating such enhancements. Contractor and Company shall mutually agree in writing as to whether Contractor shall pursue the development of such enhancements, and, if so, which party will fund such development. The Specifications will be amended to include such enhancements. For all of Contractor's services under this Agreement, Company shall compensate Contractor in cash, pursuant to the terms of Exhibit A attached hereto. In the event Company fails to make any of the payments referenced in Exhibit A by the deadline set forth in Exhibit A, Contractor has the right, but is not obligated, to pursue any or all of the following remedies: (1) terminate the Agreement; (2) remove equipment owned by Contractor, whether leased to Company by Contractor or not, and remove any Contractor personnel or Staff from Company location(s); (3) bring legal action; or (4) Contractor may suspend development of the Project and is responsible for any schedule changes required and additional financial impact. Company and Contractor acknowledge and agree that the Specifications and all other documents and information related to the development of the Materials (the "Confidential Information") will constitute valuable trade secrets of Contractor. Company shall keep the Confidential Information in confidence and shall not, at any time during or after the term of this Agreement, without Contractor's prior written consent, disclose or otherwise make available to anyone, either directly or indirectly, all or any part of the Confidential Information. Contractor warrants that the Materials will conform to the Specifications. If the Materials do not conform to the Specifications, Contractor shall be responsible for correcting the Materials without unreasonable delay, at Contractor's sole expense and without charge to Company, to bring the Materials into conformance with the Specifications. This warranty shall be the exclusive warranty available to Company. Company waives any other warranty, express or implied. Company acknowledges that Contractor does not warrant that the Materials will work on all platforms. Company acknowledges that Contractor will not be responsible for the results, productivity, or any other measurable metric not specified in Exhibit B, obtained by Company on the Materials. Company waives any claim for damages, direct or indirect, and agrees that its sole and exclusive remedy for damages (either in contract or tort) is the return of the consideration paid to Contractor as set forth in Exhibit A attached hereto. Contractor will monitor the reliability and stability of the Materials for a period of up to Days days to ensure that they perform in accordance with the Specifications. If modifications are required at any time, Contractor will confer in good faith with Company concerning the appropriateness of any modifications, and mutually agree whether or not to make such modifications; provided, however, that such agreement will not be deemed to relieve Contractor from Contractor's obligations to ensure that the Project continues to conform to the Specifications and compensation estimates as set forth in Exhibit A. Contractor shall be retained as an independent contractor. Contractor will be fully responsible for payment of income taxes on all compensation earned under this Agreement. Company will not withhold or pay any income tax, social security tax, or any other payroll taxes on Contractor's behalf. Contractor understands Contractor will not be entitled to any fringe benefits that Company generally provides for Company's employees or to any statutory employment benefits, including, without limitation, workers compensation or unemployment insurance. Company agrees to make available to Contractor, for Contractor's use in performing the services required by this Agreement, such items of hardware and Materials as Company and Contractor may agree are reasonably necessary for such purpose. This Agreement shall be binding upon and inure to the benefit of Company and Contractor and their respective successors and assigns, provided that Contractor may not assign any obligations under this Agreement without Company's prior written consent. Contractor has no right to assign, sell, modify, or otherwise alter the Materials, except upon the express written advance approval of Company, which consent can be withheld for any reason. Contractor warrants that the Project will conform to the Specifications, or such other specifications as are agreed to in writing by Contractor, for a period of one year from the date of completion of the Project. If the Project does not conform to the Specifications, as Company's sole remedy, Contractor shall be responsible for correcting the Project without unreasonable delay, at Contractor's sole expense and without charge to Company, to bring the Project into conformance with the Specifications set forth in Exhibit B. This warranty shall be the exclusive warranty available to Company. Company waives any other warranty, express or implied. Company acknowledges that Contractor is not responsible for the results obtained by Company on the Project. Company acknowledges that Contractor is not responsible for fixing any problems, errors or omissions on the Project after Company has tested, proofed, and approved the Project and either a written approval has been given to Contractor or the Project has been mass-produced or transmitted in the Public Domain in any way. Company waives any claim for damages, direct or indirect, and agrees that Company's sole and exclusive remedy for damages (either in contract or tort) is the return of the consideration paid to Contractor as set forth in Exhibit A attached hereto. No action, regardless of form, arising out of any claimed breach of this Agreement or transactions under this Agreement may be brought by either party more than one (1) year after the cause of action has occurred. Contractor will have no rights in making any derivative works from any of its work, practices, coding, programming, or other work on the Materials as outlined in the Specifications. Contractor identification may not be annotated within any of the code or on the web site as the author. Contractor also agrees not to use copyright notices on Materials and the relevant content therein. Insert even stricter usage requirements if you wish. If your Company or project has an interest in not disclosing that your product, project or other relevant work has been provided by a Contractor - use this section to restrict such rights. Otherwise, your project may wind up in the Contractor's portfolio, blog, etc. The parties represent and warrant that, on the date first written above, they are authorized to enter into this Agreement in its entirety, and duly bind their respective principals by their signatures below. The complete Works for Hire Agreement - with the actual formatting and layout - is available in this Contract Pack.